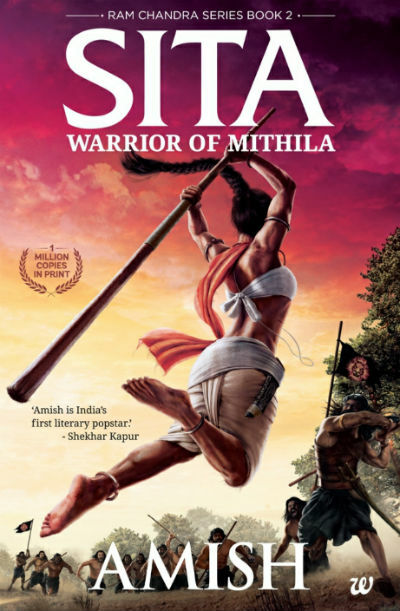 Sita – Warrior of Mithila is the second book in the Ram Chandra Book Series by popular Indian author Amish Tripathi. We’ve talked at length about the free content of the book which is available to download for free for anyone having a valid Amazon account in the below-mentioned review article. The free content of the book (and of course, the satisfactory experiences of reading other books by Amish Tripathi) made us curious to read Sita – Warrior of Mithila as well. And, here I present my personal and unbiased views and reviews for the same. As the name suggests, the book explores the character of Lady Sita, the better half of Lord Ram (aka Lord Rama). While there is a lot written about Lord Ram and Lady Sita, it is almost written in a mythological way. Over the period of time, tales are added and new versions of “Ramayana” were written and told. The tale, be it mythological or real, regardless of its status, serves as one of the most genuine guidelines for society to become much better as a unit. And, in addition, it is most respected for the ideal characters, the basic most units of the society, and the way they are represented. For an instance every educated (in the true sense) Indian wants his son to be like Ram and daughter or daughter like Sita. A lady wants a husband like Ram and a man wants a wife like Sita. This is the intensity, the tale is weaved in the lives of those who follow Hindu culture. So, it is definitely a challenge to modernize and re-tell one of the most famous tales in a way that it will be found interesting by the majority of the readers without creating controversies or offending people, and at the same time, adding contemporariness to it as well. Let us take a bird’s eye view of the plot of the book. It all starts from the early days in the life of Sita, an adopted daughter of Janak, the king of Mithila. Known for his knowledge and wisdom, Janak was an intellectual person. Despite being a king, he had no hunger for the power and he was not on the quest to expand the boundaries of his kingdom. He would rather love spending time in exploring knowledge and arranging intellectual debates. His brother Kushdhwaj, though never openly show any displeasure against it, keeps his focus in making his own kingdom better and wealthy. The situations took a turn when Kushdhwaj’s interest are in conflict with the way of thinking and ruling king Janak preferred. Sita grew up under the influences of knowledge from her father and realistic administration from her mother lost her innocence when she was quite young. Her visit to the outskirts of Mithila shaken her from inside. While she got one of the most dependable friend she had from this visit, the incident also helped her choosing her goals or rather the way of ruling when she had to take the matter in her own hand to help her mother. Sita was trained in the warrior skills and she is exceptionally good with some of them. She believed in disciplined life and cannot tolerate violation of any code of conduct. Some forces who despite having different philosophies and way of thinking believed that the next Vishnu is the one who can stop Raavan, the mighty king of Lanka. Their supreme leaders however had different thinking about who is the next Vishnu. Both of them have their favorites to whom they wanted to train and project as the next Vishnu. This conflict linked the fate of Sita with the same of Ram, the prince of Ayodhya. Ram was directed to visit the Swayamvar of Sita. In Mithila, the consequences took unexpected or rather we say expected but unwanted course of action and Ram along with his brother Lakshman had to work in saving Mithila from Raavan and his troops. This course of action lead to the union of Ram and Sita and they eventually needs to leave for the Jungle as it is well known to the people who are aware of Ramayan. What happens from this point forward, how Ram, Sita, and Lakshman lived in the Jungle, who supported them, how Sita was abducted and other stuuf is better to explore while reading the book. Amish now mastered the art of retelling the mythological tales by modernising them. He actually re-tells the stories from a different perspective and even adds contemporariness to it. The stories he tell, thus, are not in sync was the original. You, thus, needs to read this book by keeping this in mind. The experiment of telling the entire story in a series of books following the “hyperlink” flow, works pretty well in the Ram Chandra Book Series. What you will like in this book is the way the characters are build. Sita’s character is the protagonist here and author does a fabulous job of not sidelining it or even other characters. While “Ramayan” is about “Ram” or mainly focused on the events happened in his life, this book sees it from Sita’s perspective. Sita’s character is explored nicely here. She is a tall and fearless warrior in this book. Her administration skills are also explored nicely. Her journey, her battles, inner and outer both, are explored nicely. The book however doesn’t sideline other characters as well. It refers to Ram, Lakshman, Vashishth, Vishwamitra, Dashrath, Kaushalya, Sumitra, Kaikeyi, Bharat, Shatrughna, Urmila, Jatayu, Raavan, Kumbhakharna, Shurpanakha, Marich, Vibhishan, Malayputras and others in effective manner. None of them are left without giving them their rightful due, without degrading any protagonists. What matters is not the weapon, but the woman who wields that weapon. Too much of anything creates an imbalance in life. This is true even of virtues such as nonviolence. You never know when the winds of change strike; when violence may be required to protect your society, or to even survive. Running away is never the solution. Confront your problems. Manage them. That is the way of the warrior. I am not sure that poor are always loyal. Those who are capable of loyalty will be loyal. Those who are not will not, no matter what I may do for them. Happiness is not an accident. It is a choice. It is in our hands to be happy. Not everyone has the spirit to keep their character strong when their stomachs are empty. You must use your heart to decide the destination, but use your head to plot the journey. Many people are not wise enough to count life’s blessings. They keep focusing instead on what the world has denied them. When logic fails, faith can serve a purpose. You alone carry the fruit of your karma. No one else. You cannot escape your karma by claiming that you were only following orders. Life is not only about what we want, but also about what we must do. We don’t just have rights. We also have duties. The Masculine way is ordered, efficient and fair at its best, but fanatical and violent at its worst. The Feminine way is creative, passionate and caring at its best, but decadent and chaotic at its worst. No one way of life is better or worse. They both have their strengths and weaknesses. A leader should not expect more from them than what they are capable of. If you stretch them beyond their capacity, they will break. Sometimes to create a perfect world, a leader has to do what is necessary at the time; even if it may not appear to be the “right” thing to do in the short term. …, sometimes, a too-clever-by-half-plan can backfire. ‘One doesn’t need to be Vyomkesh to figure this out’, said Sita, referring to a popular fictional detective from folk stories. Not sure, if it helped adding contemporari-ness to the book. The author has referred Jallikattu as well. The mythology retold is Amish’ favorite genre but there are places when you feel it is too much of a modern stuff, which however is liked by many. What I liked the most in the book is the deserved footage given to most of the characters. The character of lady Sita gives you the real idea of what the woman empowerment really is. Women empowerment or feminism is explored to male bashing, wearing short cloths and having adultery, by many (including authors). Amish does a brilliant job here in showing what the phrase “an empowered person” means. Amish is good at detailing of war and weapons. His way of scene building and explaining and exploring the surroundings is something not to be missed. He is also good at marketing and he knows what readers want. So, in addition to promote the book nicely, he also writes in the way it is welcomed by the readers. And, it is definitely a skill which every author wants to master. Overall a nice book, which has its own lows. The book has a substance and it is written with a nice vision. The effective marketing of the book already lead it to the bestsellers list. If you’ve loved reading previous books by the author, you will surely not want to give it a miss.